Higher up the rock face was a team of climbing engineers. Clad in bright red rubber suits for protection, they draped ‘high-tensile slope stabilisation mesh rockfall protection’ across the cliff face. We’re talking ultra high-performance materials here. 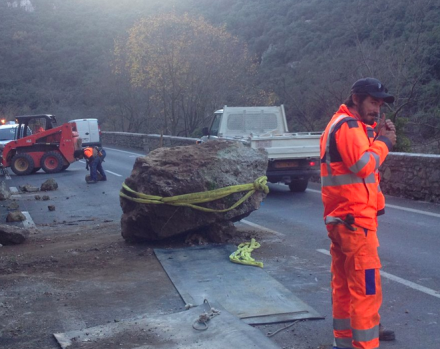 Considering they’s they’d been working away for months I was surprised, yesterday, to find a large boulder in the middle of the road. I’d guess it weighed 800 kilos, maybe more. A bunch of guys in high-viz jackets were standing around the rock. Two were on their phones. One was fiddling with an iPad. And an older guy with a beard was staring at the rock. Thoughtfully. Now when confronted by a big rock, it’s actually a good thing to contemplate it for a while – maybe a day or two – before trying to shift it. At least by hand. I learned that from a master craftsman who makes stone walls in the Cevennes, where I live. But the mystery here was that the stone was under a stretch of cliff that had just been been stabilised by the highest-tech systems that man could muster. Looking up at the cliff, I fancied I saw a mischievous smile on its craggy face. “Bring on your high tech tools and gadgets” the face seemed to say. “Show me what you’ve got. What I’ve got is a trillion more tonnes where that stone came from – and all the time in the world”. You’re probably thinking: A sentient cliff? What hippy nonsense. Forty years ago – the blink of an eye in geological time – when I was sitting where you are today – the first paper on Gaia theory had yet to be published. But then everything changed. Profoundly. From then until now, studies from diverse disciplines have converged around a remarkable proposition: Living systems, and the non-living world, are intimately interconnected. The more we learn from biology – about the mutuality that suffuses living systems; from geology – about the organic origins of rock formation; from botany, about the role of lichens and bacteria in weathering rocks; from physics – about energy flows; from mycology – about the exchange of information among plants; from chemistry – about interactions among chemical beings; and from marine scientists – about the importance of plankton to food systems. Well, as all these findings accumulate, and converge, they reveal how intimately we, too, are enmeshed with the biosphere as a whole. I do wish I’d known that when I was your age. I wasted a lot of time thinking the world could be shaped by force – using design and tech. But what I didn’t know then, I do know now. And so do you. In the living systems that surround us you, me – and that rock – are all connected. Our old certainties are melting into air. It’s a glorious time and place to be. Thank you for your post! Rock fall is scary to prevent even when such great technology is available. I’m glad you weren’t hit by a boulder while driving. I’d rather have workers take months to make sure that area is safe to be in then rush any kind of job like that.